For First Class Mail, USPS rates are based on the size and thickness of your mail piece. Follow the instructions below to determine the type of First Class Mail you are trying to send. 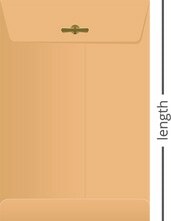 Using a ruler, measure the length, height, and thickness of your mail piece. Length is the dimension that is parallel to the address. If your mail piece is too thin to measure the thickness, ignore this for dimension for now. In addition to dimensions, you will also need to weigh your mail piece. 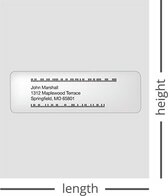 Using the parameters below, match your mail piece to the shape that fits your mail piece is all dimensions. In order to qualify for a particular shape, your mail piece must meet all qualifications. If your mail piece is too long, wide, thick, or heavy in any single dimension then your mail piece does not qualify for a particular shape. 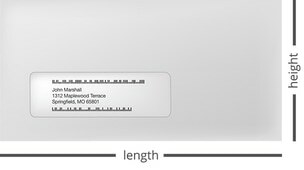 If your mail does not fall into any of these categories (too short or too narrow), it is likely undeliverable as First Class Mail; your mail piece may qualify as a package. Aspect ratio: Length divided by height: Ratio must be between 1.3 and 2.5 or the letter will be subject to a non-machinable surcharge. See step 3 for details. Maximum weight: Up to 13 oz. Dimensions or weights smaller than the minimum or larger than the maximum may qualify as a package but be subject to non-machinable surcharges. If you believe your mail piece may qualify as a letter, you will need to determine the aspect ratio by dividing the length by the height. In the example of the letter below, the aspect ratio would be (9.5 inches by 4.125 inches) resulting in an aspect ratio of 2.3. Aspect ratios less than 1.3 or greater than 2.5 are subject to a non-machinable surcharge. Once you have determined your mail, it's easy to print postage for your First Class mail piece with Stamps.com. With Stamps.com, you can print postage for any mail class without a trip to the Post Office. Not a Stamps.com customer? Click here for a 4-week trial and send your mail today! For more help with First Class Mail classifications, visit the Stamps.com Store to obtain a shape-based template to help with your mailings!